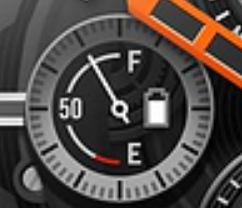 can somebody give me a step by step guide on how to make a 'fuel gauge' battery exactly like the one on the galaxy watch and also if you know how to a step gauge also like the one on the galaxy watch... basically im making a modded galaxy watch lol. any help is appreciated im a beginner so sorry if I sound stupid. when im finished ill share my watch with all of you. can you post a photo of the gauge? 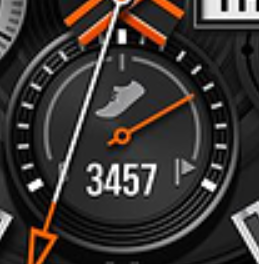 Try looking in 'Watchface Design' category of this forum. If I understand you correctly you are looking to do a battery gauge. I did something similar while trying out various tags. This gave me a bar to represent the watch battery and the equation was to make it fit the scale I was using. 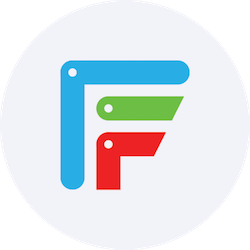 I'm assuming you have all of your artwork ready and just need the formula to move the pointer hand. #BLN# is the watch battery level as an integer. It's values run obviously from 0 to 100. So if we use it to move the pointer (rotation) it will move only 100-degrees in a circle. We can scale the movement by multiplying by 1.8. That will make the needle sweep 180-degrees between 0 and 100. Finally, full is on top, empty on the bottom, so we have to rotate the dial overall by 180-degrees. That you can just add. One caveat - the gauge will break at 0% battery because #BLN# does not run all the way down to zero. Doesn't matter... the watch is dead, you wont see it. Thank you so much I appreciate it also I love your designs! yeah @smith3connor pretty much same idea. You have to (a) scale the sweep of the needle to the range of min-max values and (b) rotate the whole dial to set the start of the sweep. You may also need to (c) add a negative sign in somewhere if the needle has to move in the opposite direction. In the step gauge above it's a little hard because the gauge doesn't indicate the max value. Looking at it, the needle is about 70-75% of something? I don't know which way the gauge is going. However... I happen to like 12,000 step gauges so let's try that. We have to make some other decisions as well. How big is the sweep? In the gauge above, I'd say the sweep is a little less than 2/3 of a circle, but let's use 2/3 or 240-degrees. With 120 degrees on the left side and 120 degrees on the right. Also let's make zero on the left side and 12,000 steps max on the right side. First, the direction: when I add a needle pointer and make the rotation = #ZSC#. The needle moves in the right direction - left-to-right. So we're good there. The scale: Next, I want my gauge to sweep 240 degrees from 0 to 12,000 steps. So 240/12,000 = 0.02. Everytime I take one step, the needle moves 0.02 degrees. We use that as the scale: (#ZSC * 0.02). 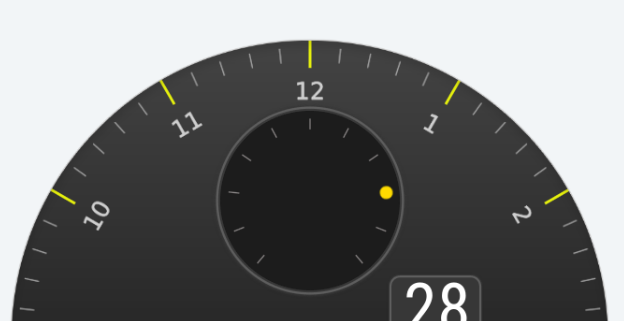 The start point: I don't want my gauge to start at 0 degrees (12:00 position). Instead I want to split the 240-degree gauge evenly between left and right. So, I'll shift the whole gauge sweep to the left by half the scale - 120 degrees. Now the needle will sweep correctly. It's a little hard to test with the timeline in the Creator because steps will only increase to 2878 as you drag the timebar. but there are other mathematical ways to test the gauge. If you want a different MAX steps value let me know. Hi there. 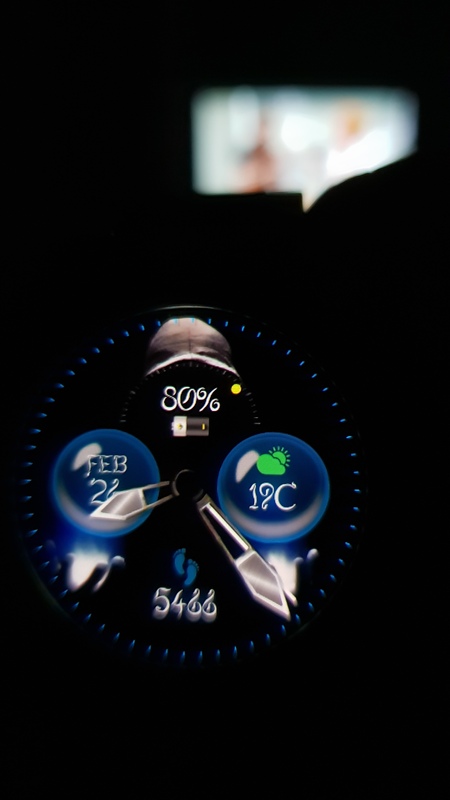 I understand you made the Samsung gauge. Can you help me with one please. The photo above with the dot that moves for the steps. I would like to use that for the battery please rather than a dial. 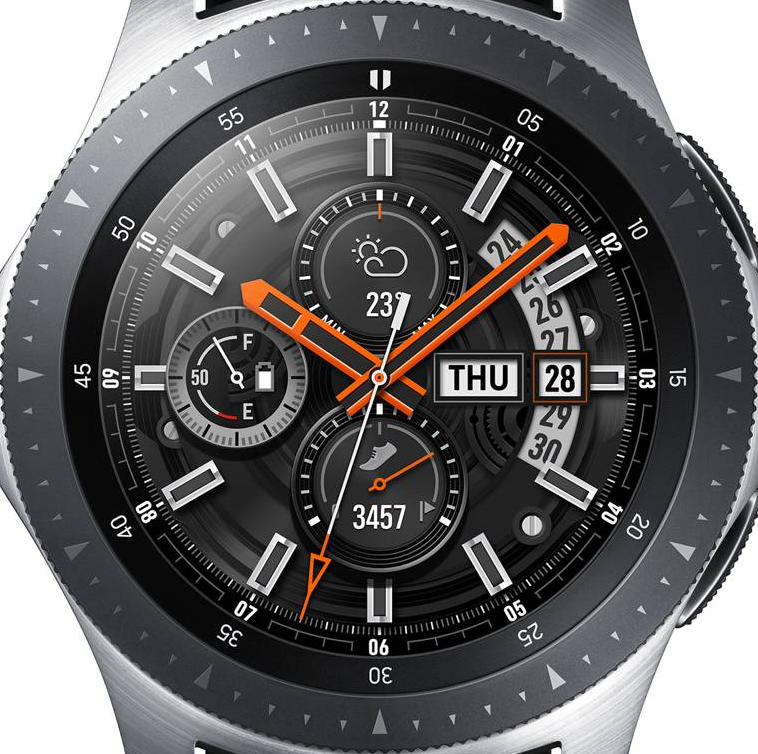 Or, to same scale as which watchface? 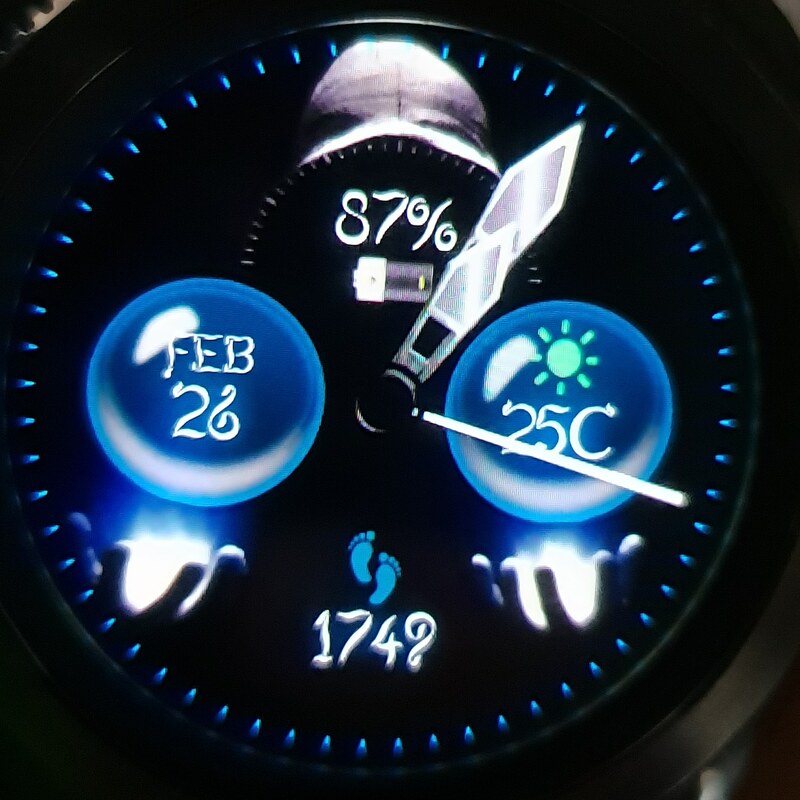 Here is a pic of the watch face. The dial is the one in the face of the person. 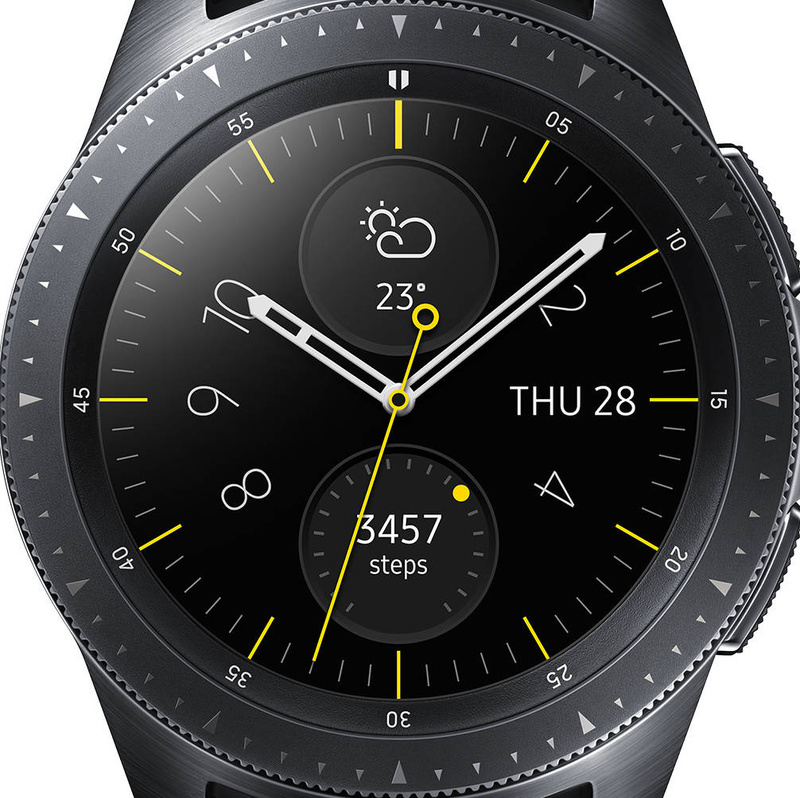 I currently have a yellow dot at the end of a clear watch hand and have it move like a dial. That might be the only way to do it. Any help is appreciated. Yes so the dot is visible on a transparent rectangle. 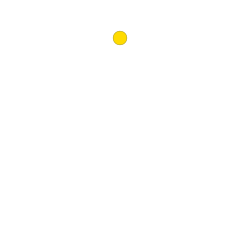 The code then makes the arm rotate moving the dot. It I just used a dot on its own, the dot would just rotate and not actually move. Or, rotate the pointer (image) back by (in your case) 90 degrees, to reset origin.